Tentworld: Out Now! Camps 7, the latest ultimate guide book to camping in Australia! Out Now! Camps 7, the latest ultimate guide book to camping in Australia! The brand new Camps 7 book out as of February 2013. Regarded by many as the must have camping accessory. Just released - February 2013is the all new Camps Australia Wide - Camps 7 book, is the latest edition to the Camps series. Released every two years, the latest Camps 7 book is the most up to date directory of free camp sites, rest areas, community camps, showgrounds, station stays, national parks, state forests & parks all with matching GPS co-ordinates. 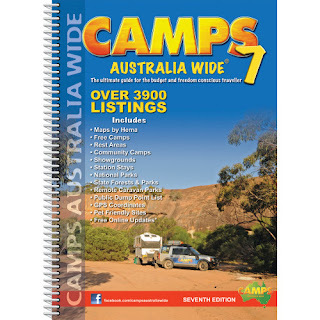 The Camps Australia Wide Camps 7 book is your best friend when on the road in Australia. Included within the Camps 7 book, is a Hema Road Atlas allowing for confident navigation around this vast country. Camps 7 has now been superseded by Camps 8 Available here.